From Technology to Art: Robots don't cry? My art piece: ROBOTS DO NOT CRY? is currently presented at juryed exhibition ARTISTS 2010 by Finnish Artist association. Exhibition has 93 artworks that were selected from 1841 proposed ones. The exhibition is at Tampere, Finland. My work is at Galleria Nottbeck. The exhibition is open during 30.10.-5.12. 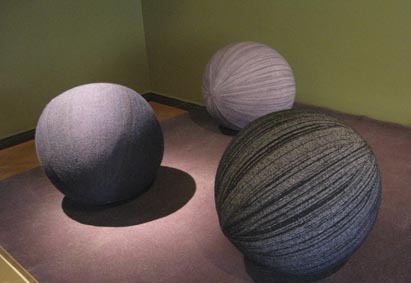 The artwork consist of three robot balls that are covered by woolknit. These robotballs present crying songs (laments) that describes different feelings from joy, frustration, and sorrow. The crying songs have been traditionally presented at funerals, weddings, and other social situations. While presenting the songs, they also move slowly. More information about this work can be found from my web pages.